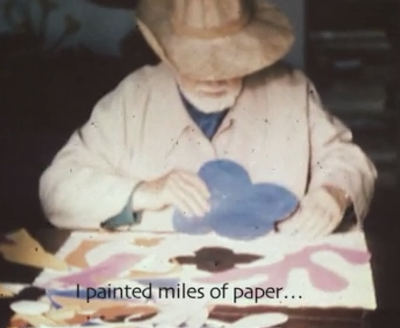 Some more notes about the documentary that shows how Matisse's midcentury masterpiece, the Chapel at Vence, came to be: first, the film features archival footage of the artist at work on his paper cutouts. 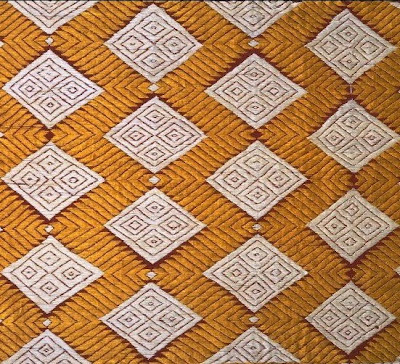 Another detail worth rewinding for is the pierced design of interior doors. 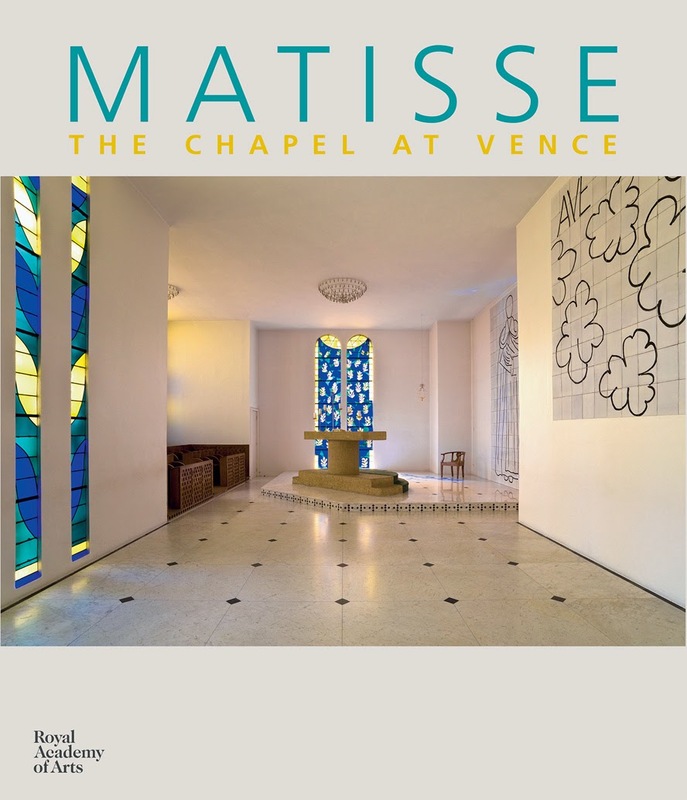 Reminds me again of Matisse's personal collection of North African haitis as well as the marble jalis Doris Duke commissioned in India in the 1930s. 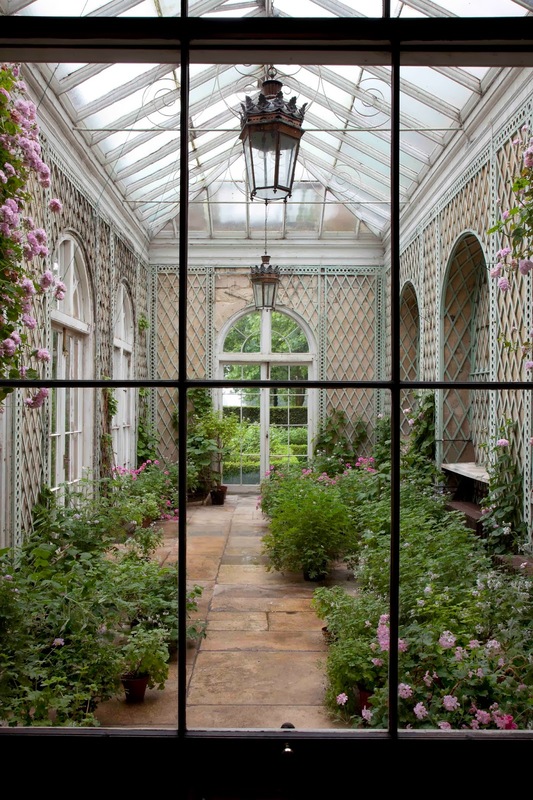 And speaking of Duke, the traveling exhibition about her masterpiece, Shangri La, is in its final weeks at The Nasher in Durham, North Carolina. 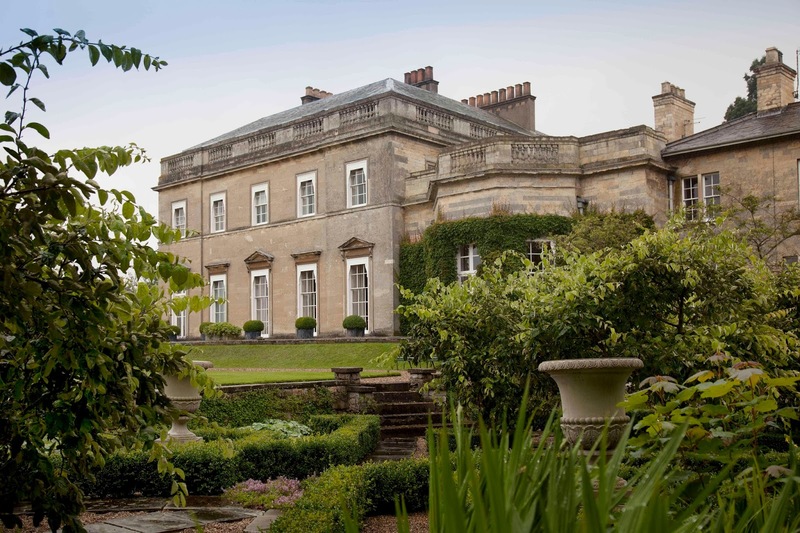 It's especially interesting to see the global treasures she acquired temporarily set in Durham, with the region that made her family fortune as a backdrop. I visited before I became hooked on this new PBS series; otherwise I'd've attempted a detour to Kinston. 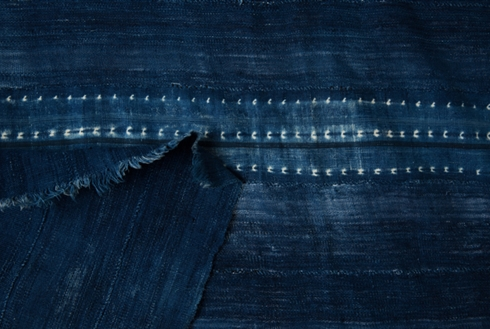 Related past post: When Art Meets Fashion. Over on Instagram I was asked for more gift-appropriate book suggestions. 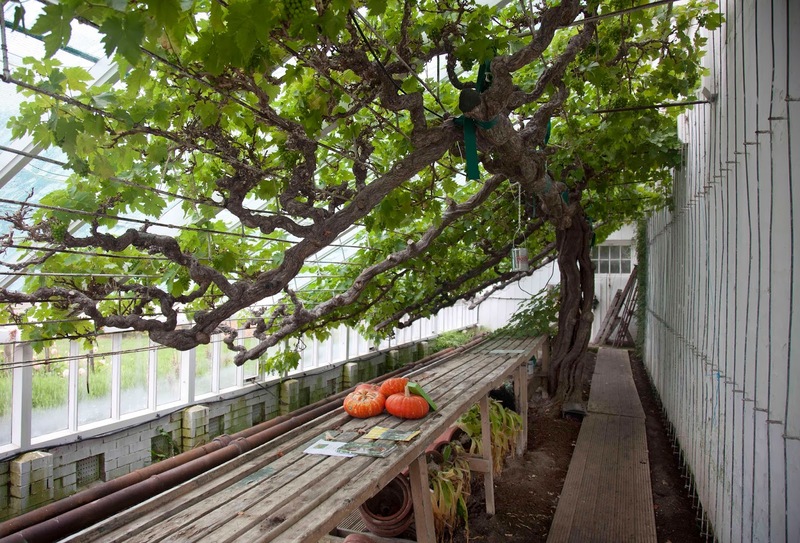 One gorgeous and inspiring limited edition book, Beauty Everyday, was self-published a few months ago by a trio of Athens-based creatives: photographer Rinne Allen, artist/potter Rebecca Wood, and TREEHOUSE owner Kristen Bach. The cover itself is a work of art but within the pages is a visual ode to the South -- 365 poetic images of found beauty. 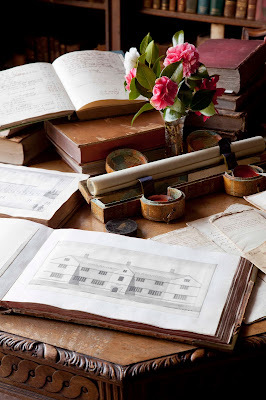 Enjoy a peek inside here. 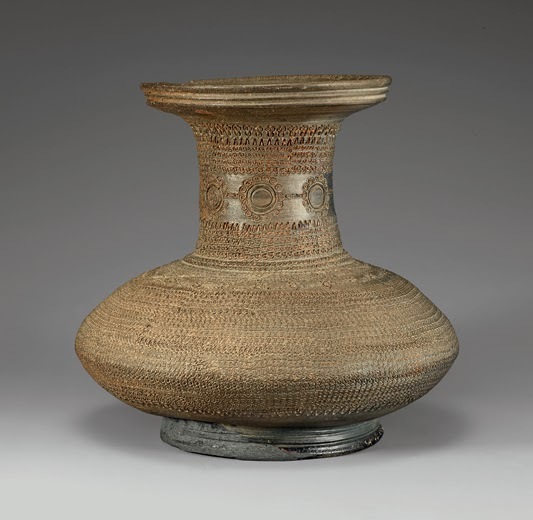 For some, the Asian collection at the Birmingham Museum of Art is an unexpected treasure. I've said it before but not everyone realizes the institution is home to the most praised collection of Vietnamese ceramics in the U.S., extraordinary Hindu and Buddhist holdings, and more than 4,000 Asian pieces in general. 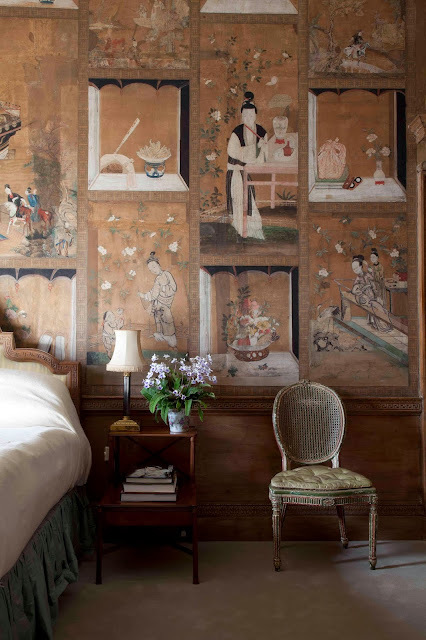 If you want to support the museum and shop at the same time, books to consider include: Asian Art in the Birmingham Museum of Art and Doris Duke: The Southeast Asian Art Collection. By the way, admission to the BMA is free and this Friday, the day after Thanksgiving, doors will be open from 10 a.m. to 5 p.m. Since wedding style was mentioned in yesterday's post, I wanted to quickly pop back with a few related links. The V & A 's upcoming exhibition schedule includes Wedding Dresses 1775-2014, a show that will explore myriad incarnations of the iconic white fashion statement. Looking over the past two centuries, I'm partial to the slip dress, especially the example above, and this 1969 lace cheongsam in the museum's collection. But another V & A piece, the Indian-inspired hand-painted Rajpunta wedding coat from 1970 is a must see. 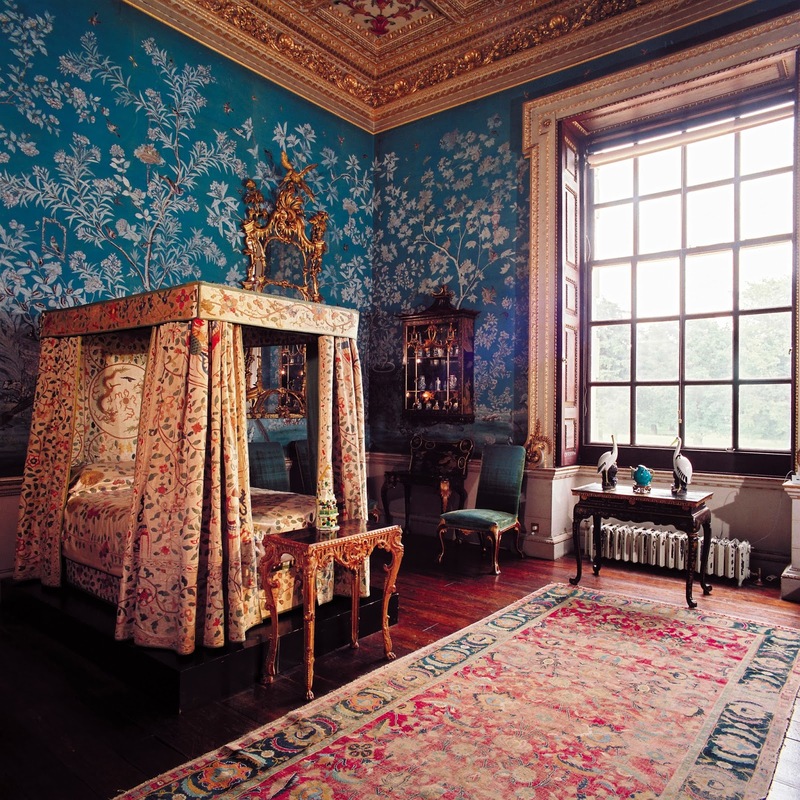 At the same time, The Met offers online a wide array of wedding dresses and accessories representing international looks, encompassing Vera Wang, Qing dynasty coats and folk pieces. 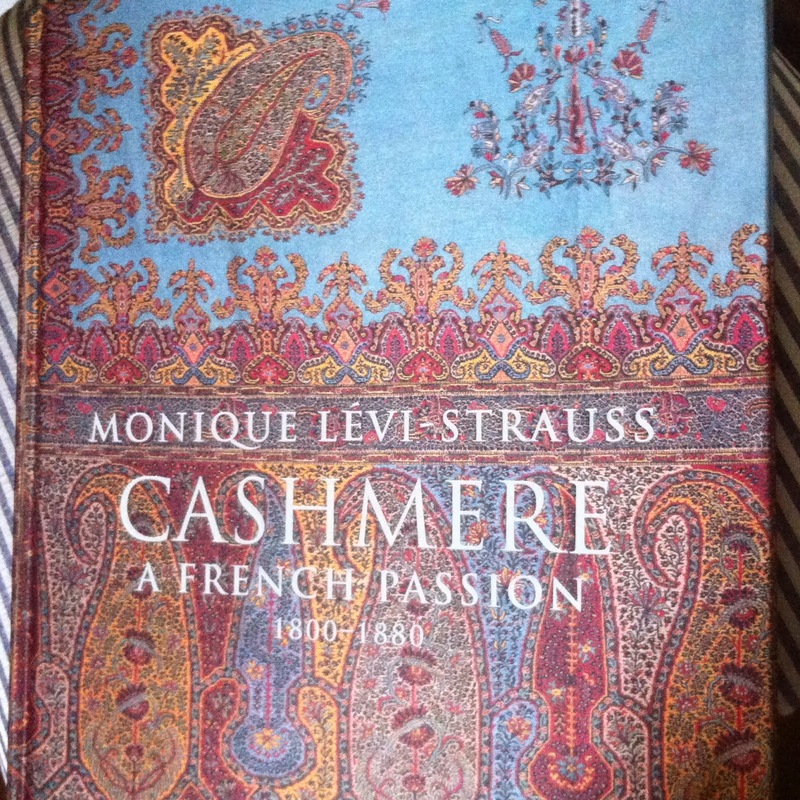 Fun fact: In France, circa 1810, patterned cashmere shawls were associated with weddings (a point made by author Monique Lévi-Strauss in Cashmere: A French Passion - 1800-1880). 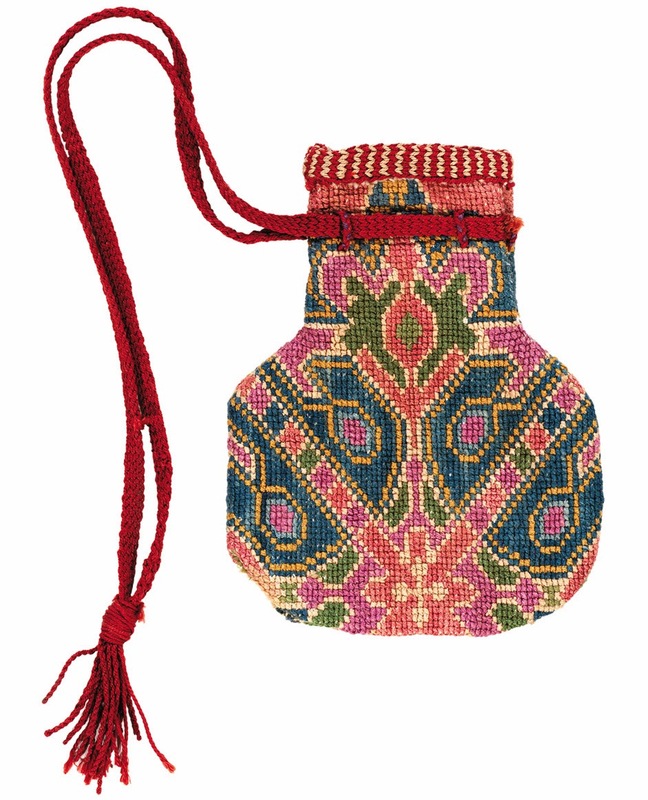 So luxe and in-demand were the textiles that they could be on par with jewels when it came to gifts from grooms to brides. For the the wedding procession of Napoleon and Marie-Louise, women in the entourage carried neatly folded shawls that contrasted with their very cleaned-lined empire dresses. 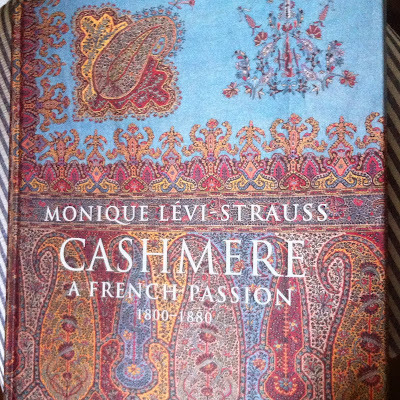 And second wife Marie-Louise received seventeen cashmere wraps from the Emperor -- all French manufactured, I believe, because Lévi-Strauss explains that Napoleon's Continental Blockade of 1806 essentially barred the original, highly coveted Kashmiri shawls from entering the country. While probably frustrating Paris' best-dressed, the move launched a new French textile industry: fine, Indian-inspired cashmeres. Anyway, now as then, a little touch of dense jewel-tone paisley looks great against an expanse of solid pale, for a wedding or a room. 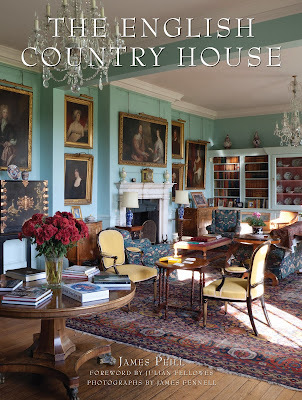 America's fascination with England's country houses continues, generating anticipation at the Museum of Fine Arts, Houston. 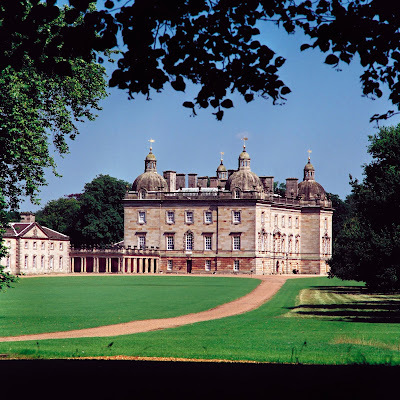 In addition to Treasures from Korea: Arts and Culture of the Joseon Dynasty, 1392-1910 (the previously mentioned exhibition traveling to the institution fall 2014), another landmark show, Houghton Hall: Portrait of an English Country House, is set to have its U.S. debut there in June. 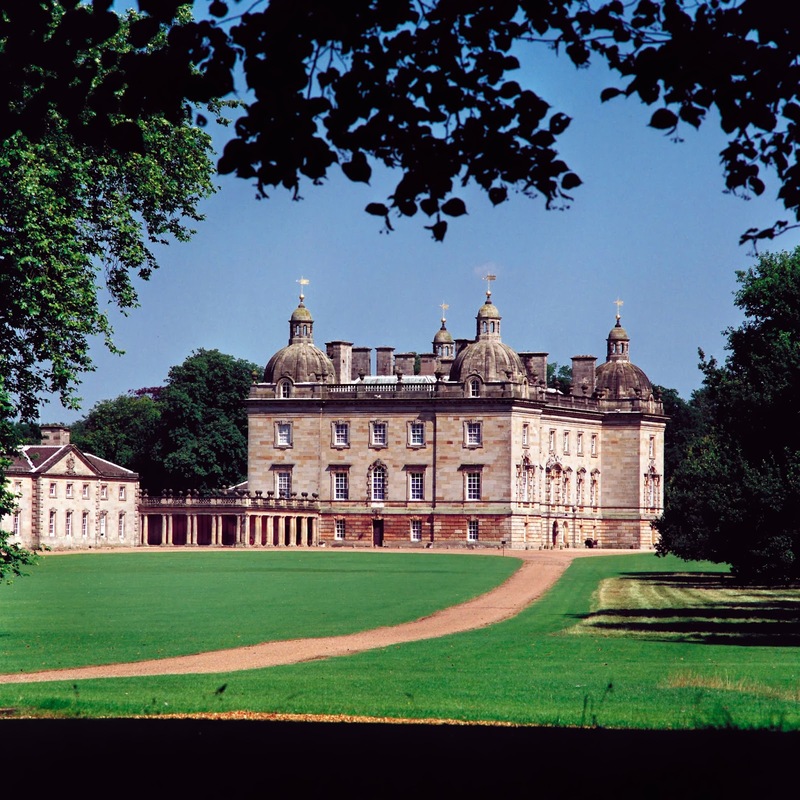 Built in the early 18th century by Sir Robert Walpole (England’s first prime minister), Houghton Hall is thought to be one of the nation’s finest Palladian houses. 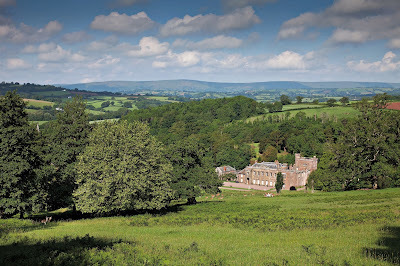 This vast place is also a repository for a stellar collection of art, William Kent furniture, textiles and other decorative arts, more than 100 of which will travel outside of England for the first time with the go ahead from Walpole's descendant and current occupant, the Marquesses of Cholmondeley. 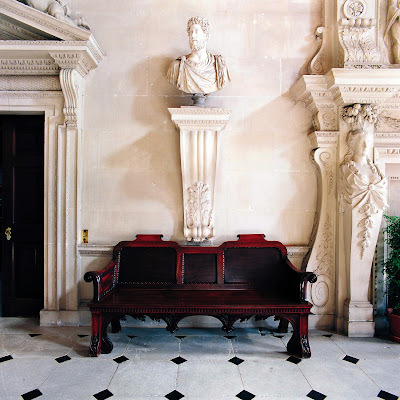 For the show, these extraordinary pieces -- costumes, portraits (think family pictures by Joshua Reynolds, John Singer Sargent, Paul Manship and Cecil Beaton), silver, porcelain and silver -- will be grouped to suggest the rooms at Houghton and tell a three-centuries long story of politics, art, and ever-changing fashion. 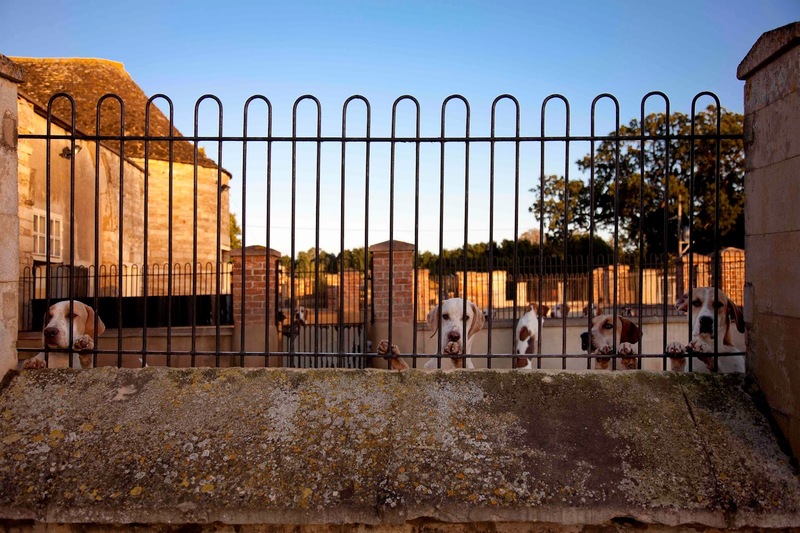 Specifically, curators are planning to use scrim panels as backdrops to define the various installations and help transport visitors to Houghton's famous architectural spaces. After its run at the MFAH from June 22 to September 22, 2014, the exhibition will go to the Legion of Honor in San Francisco and the Frist Center for the Visual Arts in Nashville. Back to the here and now, a reminder and a couple of gift suggestions. 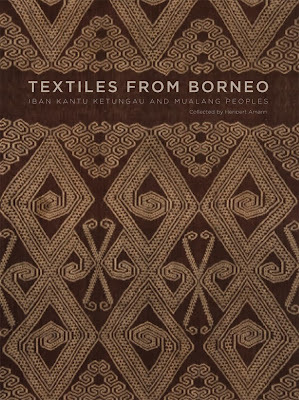 A book Matisse, the global textile collector, might appreciate for its abundance of strong pattern: Textiles from Borneo, a recently released, profusely illustrated survey of tribal pieces. The other night I re-watched Diana Vreeland: The Eye has to Travel and thought again about how the former Vogue editor and Met consultant used fashion as a sort of passport to explore the world. 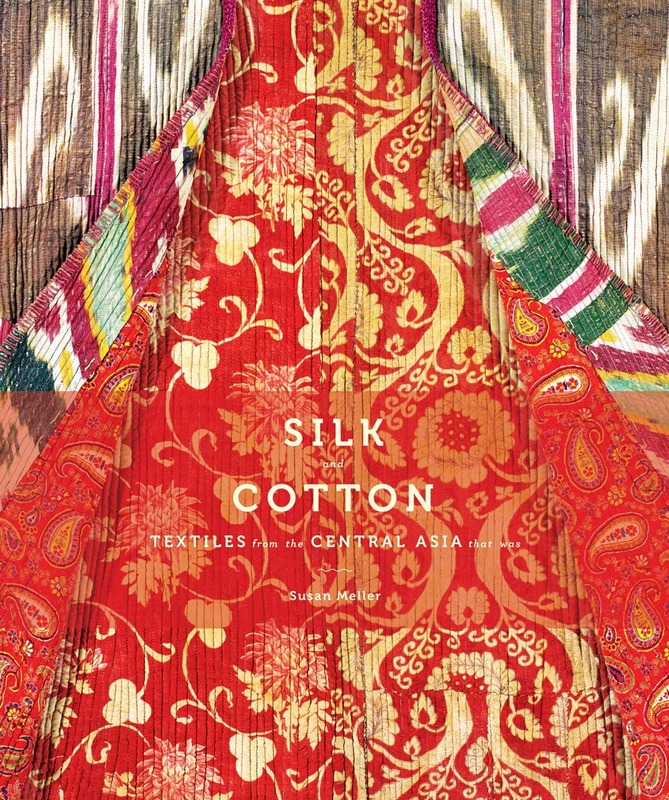 Similarly, Susan Meller's new book, Silk and Cotton, has been transporting me to Central Asia. Meller, the internationally respected textile scholar, drew me in with visuals -- colorful, often kaleidoscopic everyday textiles such as bed covers, tent hangings, headbands, horse covers, bags and clothes -- but soon I was learning more about the complex region most of us think of as "the Stans." And Meller's thorough research addresses the history of the region's artists, too. During the Soviet era, impressionist and avant-garde works were banned. 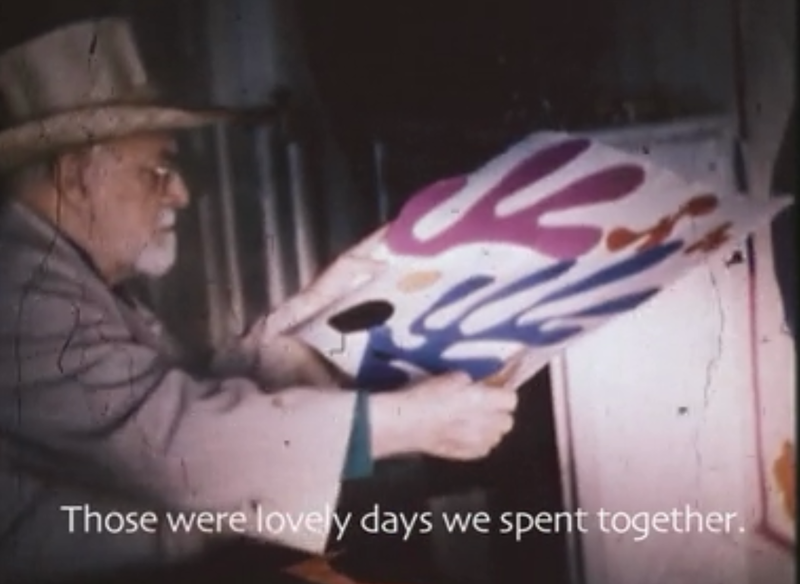 This meant Robert Falk, an artist influenced by Matisse, Gauguin and Cezanne, and a founder of the Jack of Diamonds group, remained isolated for decades; his work unappreciated until long after his death in the 1950s. If you primarily like to experience the world with your eyes, Meller offers more than 800 images, most of which are in full-blown color. 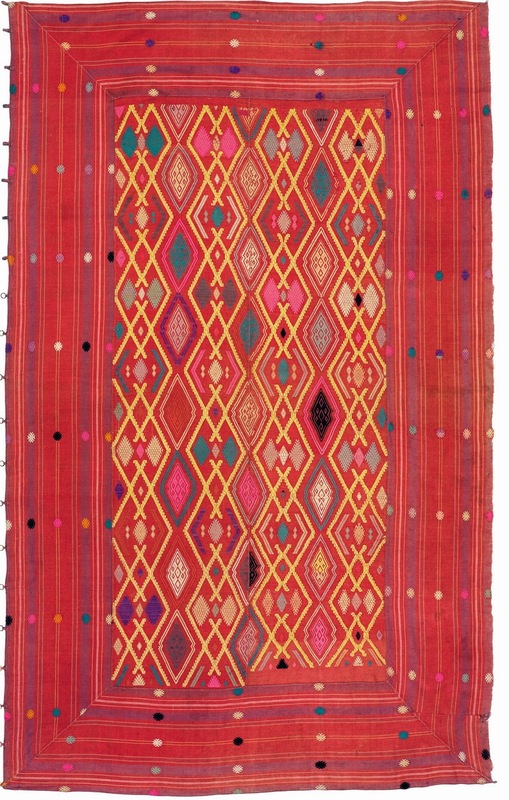 There are surprises, but there's also a sense of familiarity because traditional Central Asian textiles -- velvet and silk ikats, myriad handwoven stripes, geometrics and floral suzanis -- have had such an enormous impact on Western interior decoration during the past fourteen years or so. 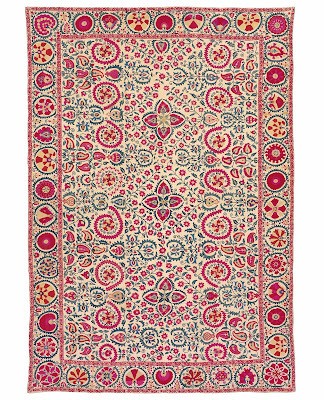 From the first antique suzani with an unbleached background photographed years ago in a Michael Smith project to the countless, more-attainably-priced printed cottons that now mimic the old embroideries, Central Asian design is all around us. 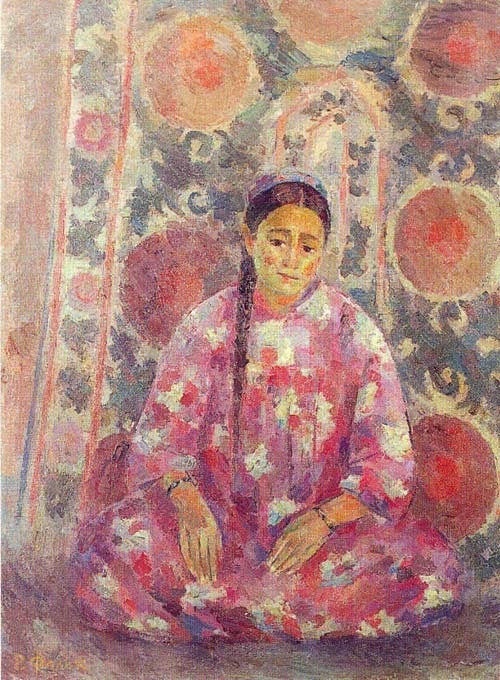 "Suzanis have enormous sophistication without the fussy coyness of French Rococo elegance...They are earthy, vital, energetic; designed to wow you, seduce you...They seem to arise from the earth...whether these images trace their origins over the millennia to Zoroastrian sun discs, Sassanian garlands, or even older sources, their ancientness is palpable." 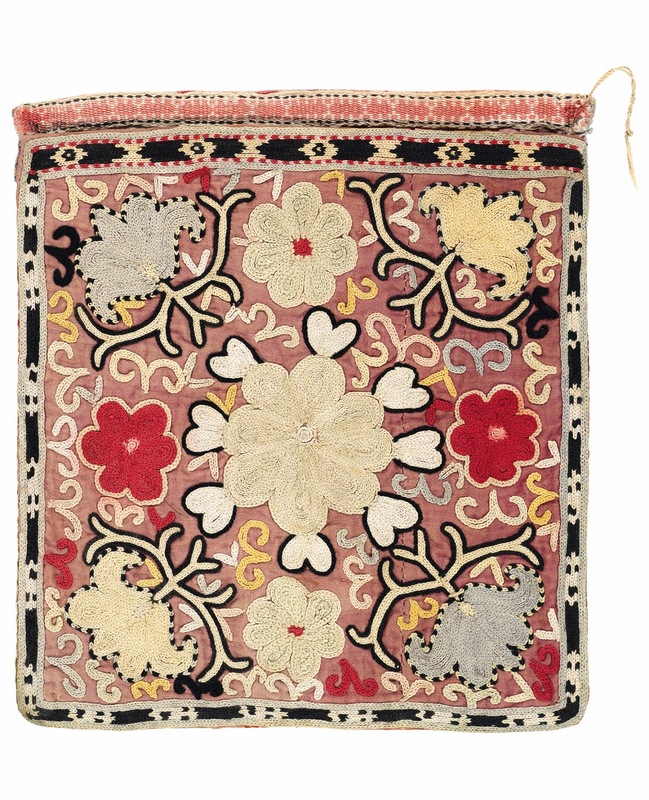 Peek under the dust jacket of the gorgeously designed tome and find a rare 19th-century Nurata suzani with allover pattern. 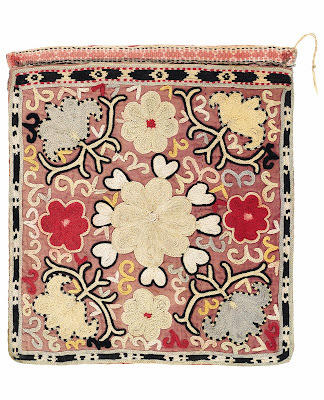 As Meller explores these embroideries in such detail, covering inter-regional differences and the relatively recent along with the very old, the book is an invaluable resource for the suzani section alone. 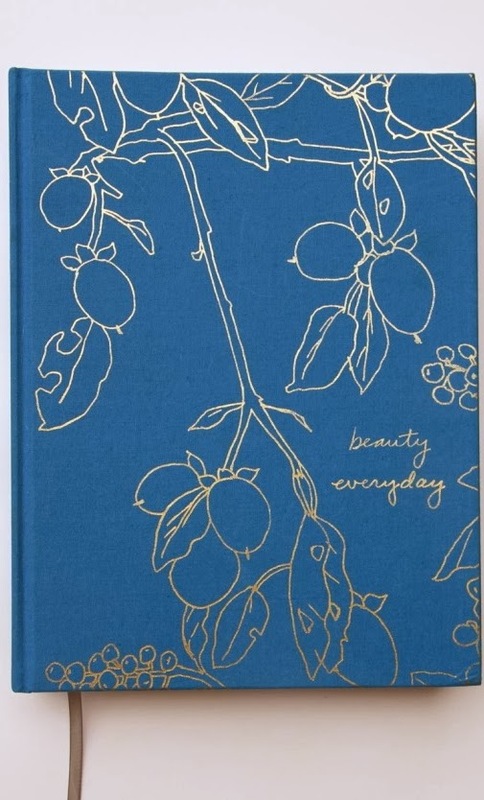 My current favorite is the previously posted unusual dark blue mid-20th-century example. With more representational floral prints back in style, I think Meller's chapter on Russian prints will interest readers who previously didn't have these cottons on the radar. 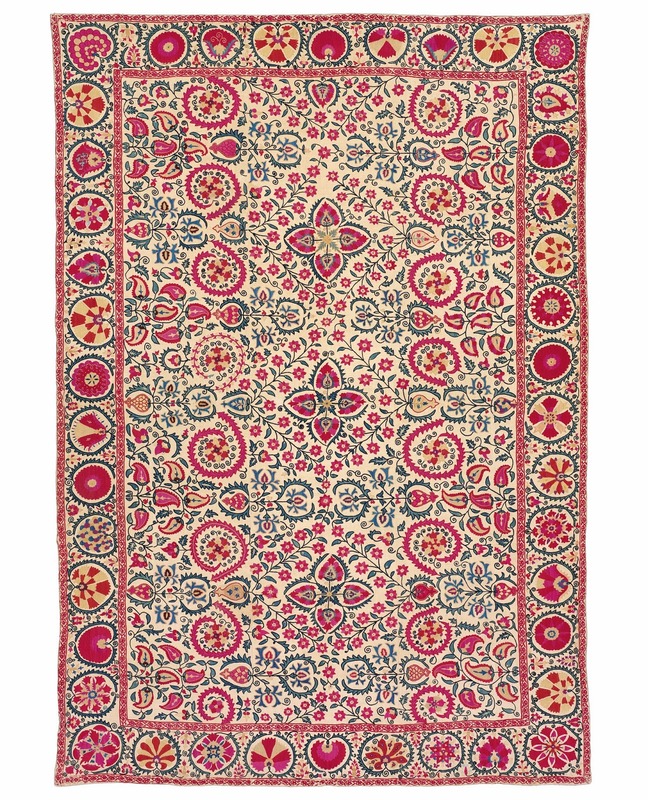 During the 19th and early 20th centuries, countless yards of Russian prints were exported to Central Asia. 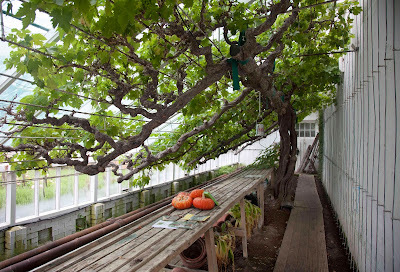 Much of it came from Ivanovo, the "Manchester, England of Russia." 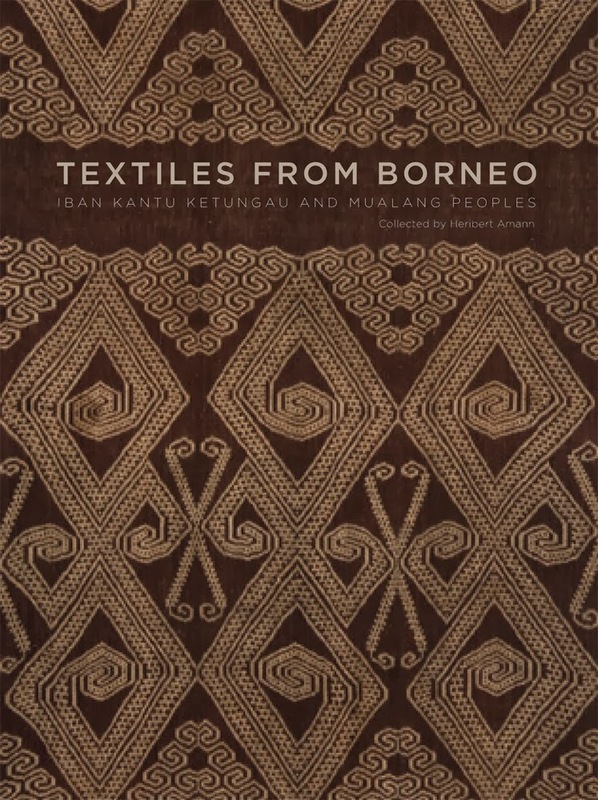 What you're not seeing here (well, except for the bit on the book's cover) are the sumptuous ikats and humbler block printed cottons, because it's a challenge to narrow a field of 800-plus strong images. 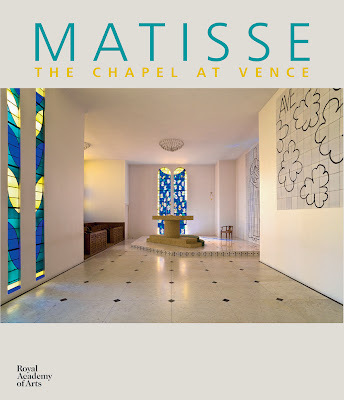 So be sure to visit Meller's own comprehensive preview and ultimately flip through the pages in person. 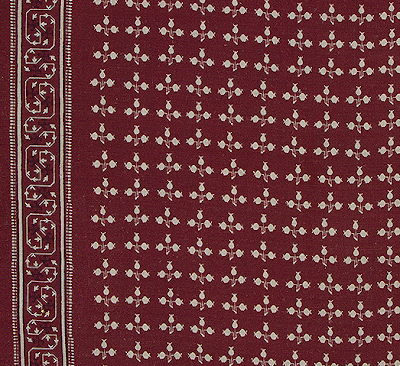 For today's pairing it's Pom, a printed-in-the-USA linen designed by Zak + Fox with a dancing pomegranate motif (here in the Rubia colorway) and an 18th-century Indian embroidered cotton that resembles chintz. The latter is in the V & A's collection and was chosen for the cover of Rosemary Crill's book, Indian Florals. 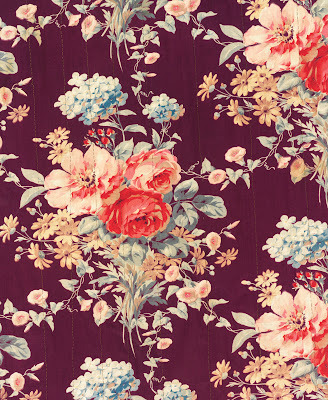 In case you missed the earlier post, Pom has a two-inch border running along both sides of the fabric. 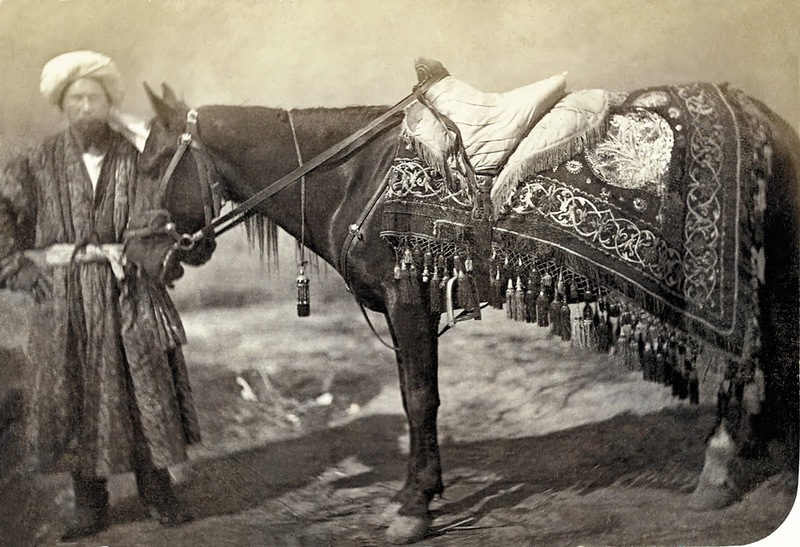 Following up on yesterday's mention of Korean art and design, the Philadelphia Museum of Art announced today that it is partnering with three other institutions -- the National Museum of Korea, Seoul, LACMA, and the Museum of Fine Arts, Houston -- to mount the U.S.'s first major survey focused on the Joseon dynasty: Treasures from Korea: 1392–1910. The exhibition is slated to open in Philadelphia in March 2014 then travel to L.A. in June and on to Houston in November. Visitors can expect to see lacquer, furniture, costumes, textiles, photographs, metalwork and of course ceramics, screen painting and calligraphy -- over 150 pieces in all. 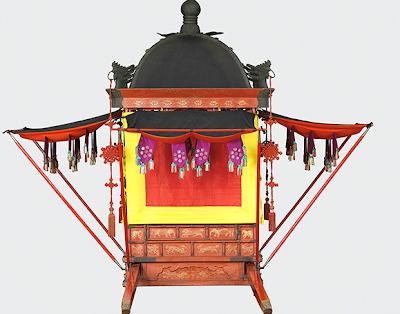 On view now at The Met: Silla: Korea's Golden Kingdom, a look at the artistic output of Korea's ancient land. As part of the festivities surrounding In Grand Style: Celebrations in Korean Art During the Joseon Dynasty, on view now through January 12, 2014 at the Asian in San Francisco, the museum will screen Masquerade right before Christmas. 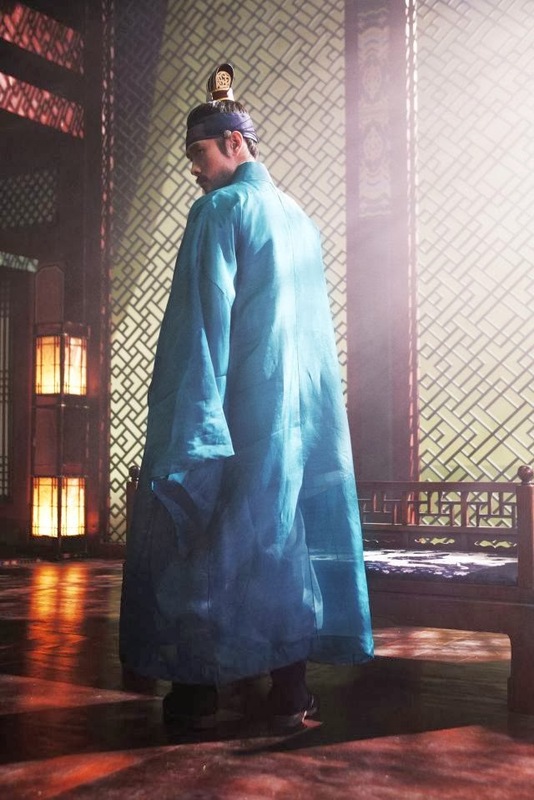 Just watching the teaser for this film about doppelgangers and intrigue within the Korean royal court, I was struck by costume designer Yoo-jin Kwon's use of luminous color. It's fun to compare the movie's palette with the range of colors found in the exhibition pieces. 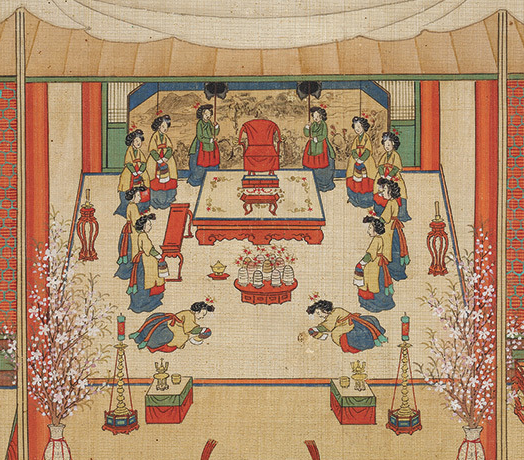 For example, shown above is a detail from an eight-panel folding screen with ink on silk: Fifty-ninth Birthday Banquets for Elder Queen Mother Sunwon, 1848. National Museum of Korea. Next: a lacquered and gold-painted Palanquin of a king, 1800-1900, embellished with silk, metal and cotton. National Palace Museum of Korea. 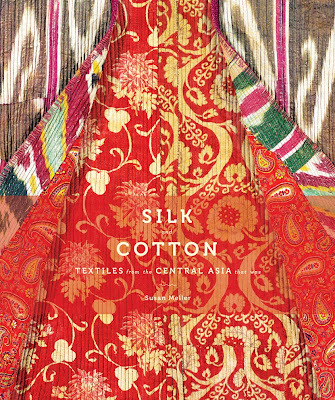 Everyone knows about Raffles and the famous drink but Singapore is also home to an acclaimed collection of Indian trade cloths acquired relatively recently by the Asian Civilizations Museum. 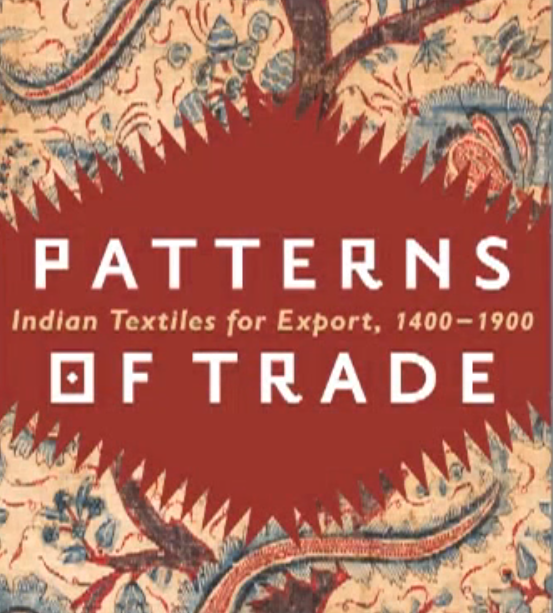 About two years ago, the museum mounted an important exhibition, Patterns of Trade: Indian Textiles for Export 1400 - 1900, that looked at the strong influence of Indian design across the globe, particularly the impact on Indonesia. 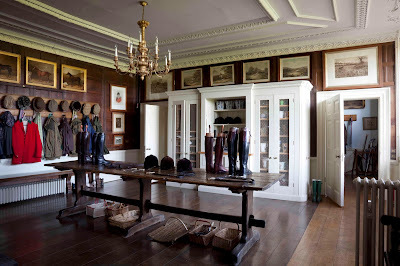 A virtual tour is still available online. Apart from a chance to see the large-scale pieces, this interactive feature really shows off the unexpected exhibition design (curator David Henkel explains his approach here). And by the way, Met curator John Guy visited the ACM to speak about the old trade cloths; catch his lecture here. A catalog was published but it's not very easy to find in the U.S.
Before you get too excited, Sibella Court's latest book, Gypsy, isn't scheduled for release in the U.S. until next year. 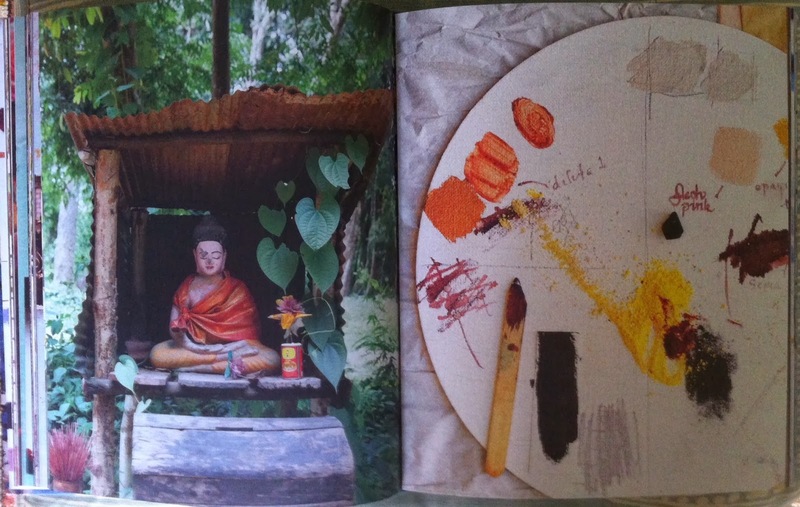 But if, like me, you decide to give yourself a holiday treat, the book can be ordered from the UK or Australia. 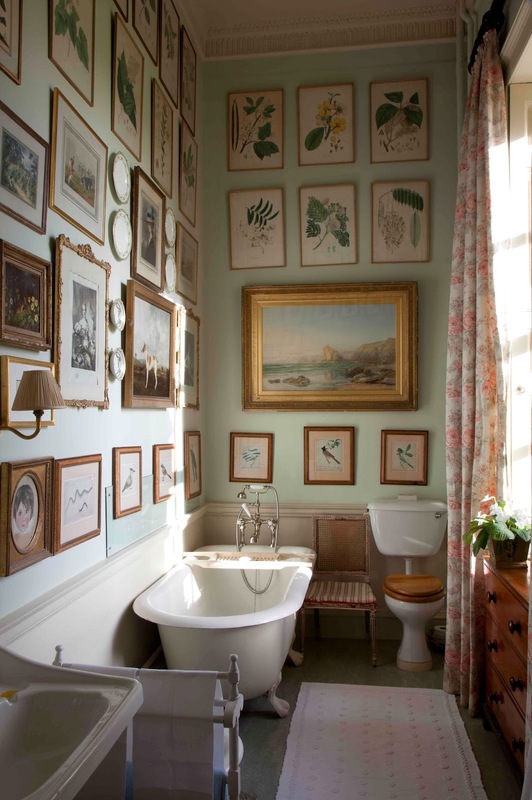 In this edition, Sibella shares luscious palettes with names inspired by her travels to five storied regions: Scotland; Transylvania; Turkey; Galapagos and Ecuador; and Indochine. She writes that she decided to use the old French term, Indochine -- referencing Laos, Cambodia and Vietnam as they are situated between China and India -- because while trekking through these countries she focused on visual remnants of the past: ochres and saffrons of traditional Buddhist monk's robes, mellow golds of shrines, and tropical pinks of those iconic Southeast Asian flower garlands. Her genius, I think, has something to do with the way she chooses brilliant yet never gaudy colors, and juxtaposes the vibrant with the smudgy and dusty. 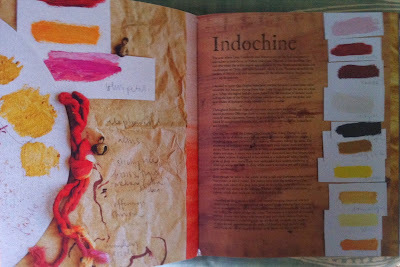 Prompted by her Indochine chapter, I'm highlighting a couple of interesting textiles connected to the area. 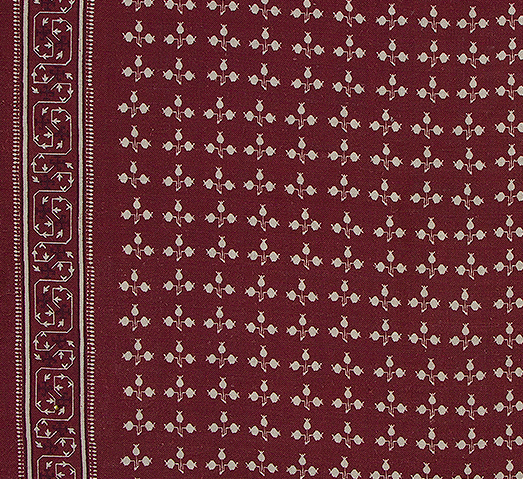 Here's a detail view of dealer Marla Mallett's antique silk brocade Tai Daeng mosquito net border (Northeastern Laos). 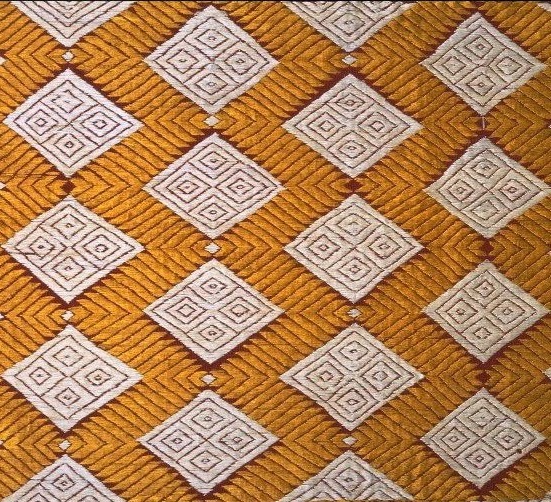 The V & A says that this geometric-patterned 19th-century woven and embroidered bedcover from their collection was probably made by Dai people who are ethnically linked to groups in Northern Laos and Thailand. For more inspiration, try a great rainy-weekend-viewing Vietnamese-French film we covered a while back, The Scent of Green Papaya. Following up on a reference from the other day, a quick reminder: the NGA's show Ellsworth Kelly: Colored Paper Images, a small exhibition of blurred-edged, not-so-immaculate works made by the artist in the 1970s, remains on view just a few more weeks (it closes on December first). 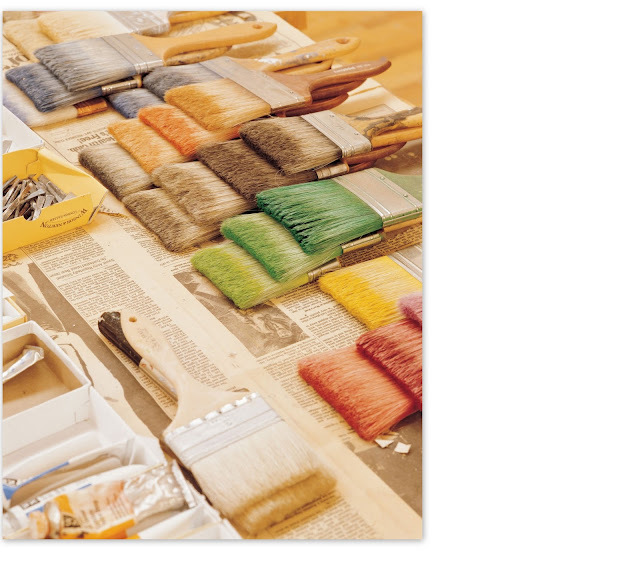 Shown above is a 1996 shot of paint-stained brushes arranged by color in Kelly's Spencertown, New York studio.